It has previously been suggested that moderate drinking could have a protective effect, however new research dismisses these claims. A study, published in journal The Lancet, found that consuming just a couple of drinks per day could boost the risk of a stroke by as much as 15% compared to people who abstain. Researchers from Oxford University, Peking University and the Chinese Academy of Medical Sciences looked at more than 160,000 men and women in China as part of the study. The group were asked about their alcohol intake and followed up for 10 years. Genetic variation in East Asian populations means some people are less tolerant to alcohol, finding it causes an unpleasant flushing reaction. They are therefore predisposed to drink less. However other factors such as educational background and levels of physical activity do not differ across these different genetic groups. This allowed the scientists to compare the risk of stroke in population groups with different alcohol intakes, but with other similar risk factors. They found that, among men, genetics that decreased alcohol intake also reduced blood pressure and stroke risk. They concluded that alcohol increases the risk of having a stroke by around a third (35%) for every four additional drinks consumed per day, compared to non-drinkers. Moderate drinkers, consuming one or two drinks per day, were at a 10% to 15% higher risk. In their study, four drinks was the equivalent of around 280g of pure alcohol. Professor Zhengming Chen, co-author from the Nuffield Department of Population Health, at the University of Oxford, said: "There are no protective effects of moderate alcohol intake against stroke. "Even moderate alcohol consumption increases the chances of having a stroke. "The findings for heart attack were less clear-cut, so we plan to collect more evidence." Trends seen in previous research, based on observational data, had indicated that moderate drinkers may be better off than non-drinkers, the authors said. However they suggest this could be because those who abstain are often people who have stopped for health reasons, and therefore may already be in ill health. Professor Sir Richard Peto, from the University of Oxford, said: "This is for the first time reliable evidence as to what really is the cause and effect relationship." The authors believe the findings apply to both men and women, and to populations across the world. Dr Kate Holmes, assistant director of research at the Stroke Association said: "This study helps to bust the myth that moderate drinking reduces your risk of having a stroke. "Alcohol not only increases blood pressure but can also cause weight gain, irregular heartbeat, diabetes and liver damage. Our advice is always to try and find ways to cut down on your drinking." 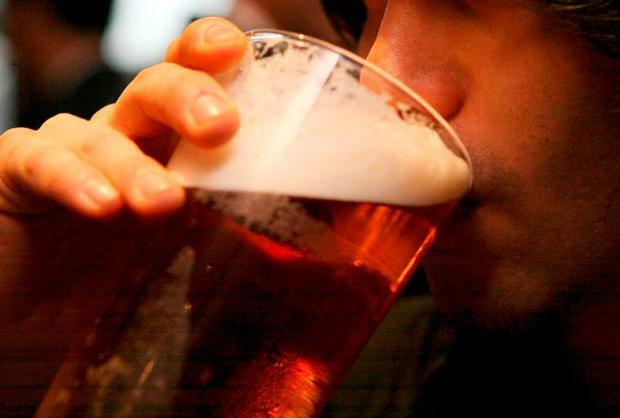 A spokeswoman for the Alcohol Information Partnership said: "We encourage people to be able to make sensible, well-informed decisions about drinking based on evidence and their own circumstances. "Drinking in the UK has been falling for more than a decade and most people drink within the new lower government guideline."